The Federal Maritime Zone of Mexico begins at the high tide line and continues 20 meters inland toward the dunes. ZoFeMaT (Zona Federal Maritimo Terrestre) is the government agency which protects this area along with PROFEPA and FONMAR. The "Federal Zone" cannot be owned, and public access must be provided by beachfront land owners. 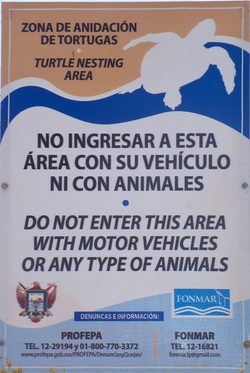 Mexican law strictly prohibits the use of motor vehicles and introduction of animals in the "Federal Zone." Conservation organizations that ride ATV's in the federal zone to locate and protect sea turtle nests have special government permits and follow protocols to minimize environmental impacts. Although the law seems to lack enforcement, foreign and domestic vehicles can be impounded, and large multas (fines) assessed.